Turn right out of the gate and walk down the valley to the Old Dungeon Ghyll hotel. 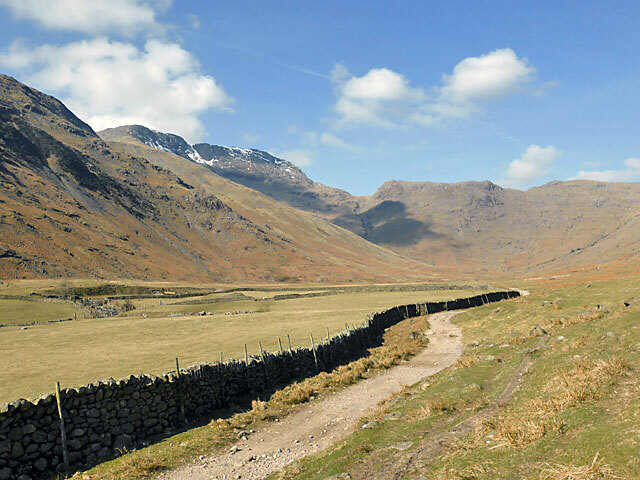 Part of the road walking can be avoided by taking the path that begins in the entrance to the NT Stickle Ghyll car park and follows a pleasant route through fields by the beck to Old Dungeon Ghyll. Enter the ODG car park and pick up the path to Mickleden that begins behind the hotel. Easy walking follows along the dramatic steep sided valley. At the head of the valley cross the footbridge next to the sheepfold. The path splits here, take the left branch signed to Esk Hause. 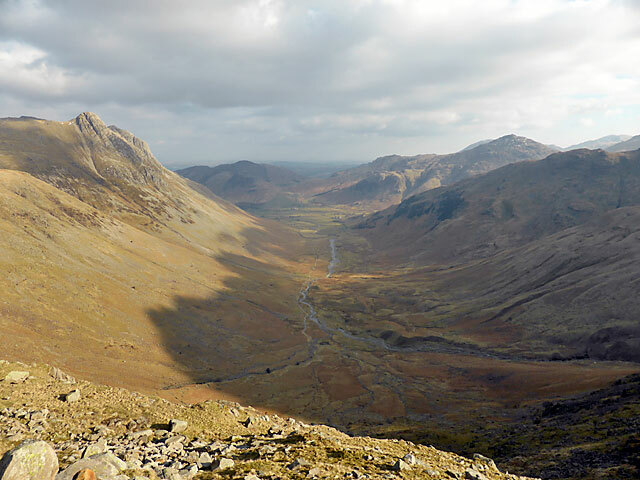 The real climbing now begins up Rossett Gill, on a stone pitched path which zig zags up beneath the cliffs of Bowfell. From the top of the gill there is a short descent to Angle Tarn, before the climbing continues towards Esk Hause, with Esk Pike on the left and a good view down the Langstrath valley on the right. Arriving at the cross shelter Great Gable comes into view ahead. Turn left for Esk Hause, the highest pass in the Lake District. Turn right here and climb up Calf cove to reach the summit ridge. 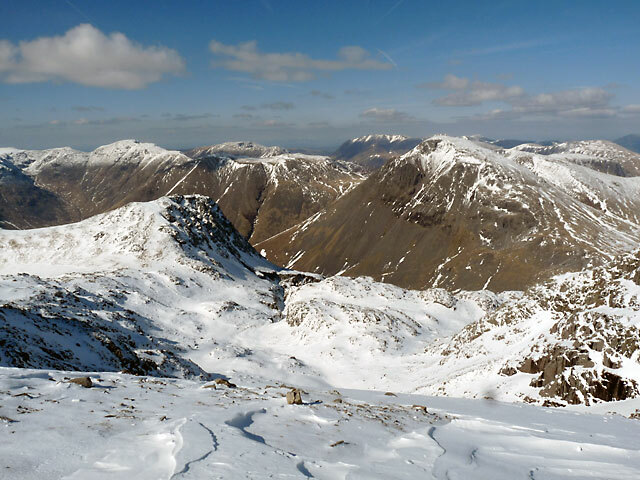 Turn left and after traversing Ill Crags (3068ft), Scafell Pike finally comes into view. A short descent leads to Broad Crag (3064ft) on an increasingly boulder strewn route. The path is indistinct, but there are lots of cairns to follow. 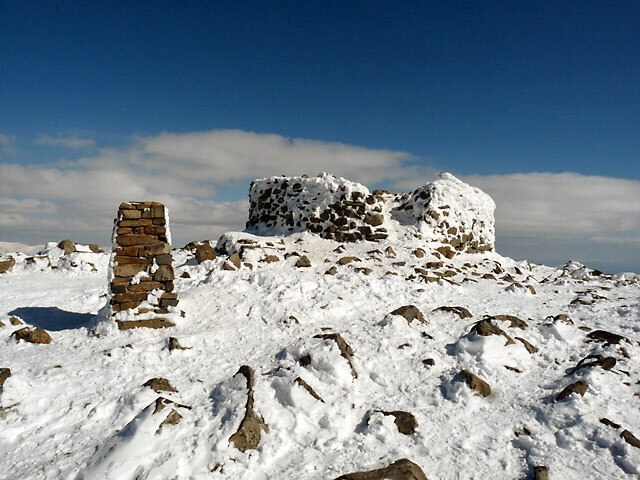 Another descent leads to the final steep scramble to the summit of Scafell Pike at 3209ft. 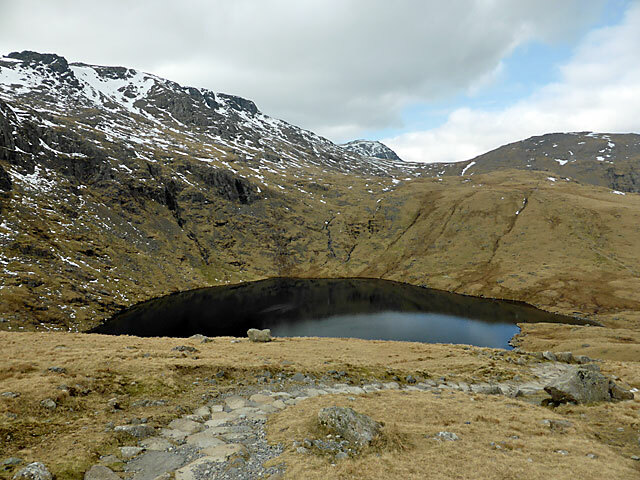 Return the same way back to Calf Cove and Angle Tarn. From here either descend the same way back to Langdale via Rossett Gill or as an alternative take the path that leads left from the tarn across grassy slopes. At a gap in the ridge at Littlegill Head, Pike O'Stickle comes into view. Head for the gap and pick up a faint path which heads to the left traversing steep slopes below Black Crags. There is a great view down Mickleden from here. The path leads down to join the Stake Pass route at Langdale Combe. Follow the zig zags down into Mickleden and head back down the valley.